4. Run FD installer and install it as standalone version. 5. To make the side and bottom panels usable, I had to detach them from the main window's docks and let them float as in screenshot. Besides, I've managed to use it to build AS3 project with JRE for Win and run the debugger with Linux-native Flash Player (as in screenshot). (Right now I don't have time to write a detailed HOWTO. But if many of you need it, I'm happy to share with you guys. So just let me know if you're interested). 1. The panels don't behave very well when they are attached to side docks. For example, the default bottom panels don't render correctly when they are attached to bottom dock. The project manager panel (when docked) display correctly only in the first run. When I close FD and run it again, project panel doesn't seem to respond. 4. The output panel is grey out once I clear it or the compiler is run a second time. 6. I have to run FD from terminal in order to launch fdbuild correctly. From all of the above, the output panel and tooltip issues are the most annoyed ones. If they are fixed, I dare to say that FD experience on Linux/Wine can reach to 70-80% of its full usability. 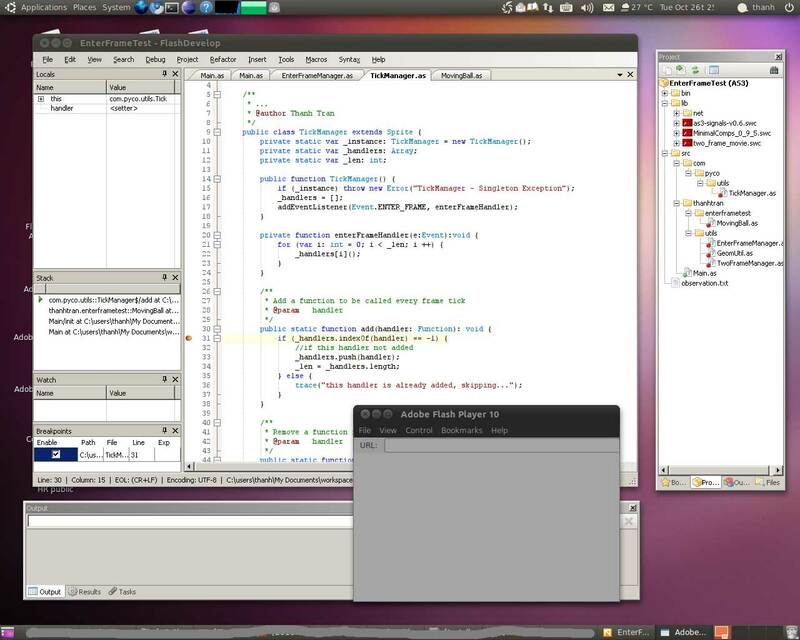 Right now I'm running it on my Ubuntu machine to code some demos and tests because project creation is much simpler and faster compared to other Eclipse-based IDEs. I don't know much about C# and Visual Studio but I have a hand-full experience with Wine. I'm willing to cooperate with FD creators/coders to take care of these issues to have a workable build of FD on Linux while waiting for the real multiplatform FD. Last edited by ttt_conan on Sun Mar 20, 2011 4:04 pm, edited 1 time in total. Hey that looks good! We are already working on FD4 and i will do my best to make FD run on Linux with this setup. I need to finish the base work for FD4 and setup a Linux dev install/machine to jump on this. I'll keep you posted on the matter. hello. I would be interested in the details. I have installed everything, set all the paths, building works, but when I trie to run sth, it displays that it wants to connect flashplayer with the debugger. I tried the windows and the linux version of flashplayer. but sth. is not working. do I have to do sth. else beneath installing jre, and choosing location of flash fiewer? @ cellstorm: To run and test your application, you should create an association of file type .swf with either Windows or Linux Flash Player. Replace PATH_TO_YOUR_FLASH_PLAYER with the physical path to FlashPlayerDebugger.exe in Flex SDK. By using winebrowser, Wine will open the file with the associated program set in Linux. I have patched FlashDevelop to temporarily fix the issue of tooltip & output panel discussed above. Anyone interested in a detailed tutorial? I suppose there is still a problem with file system changes monitoring? what happens if you create an new folder in a subdirectory of the project - does it appear in the project panel? You are right Philippe. The project panel is a little bit unresponsive. When I try to add a new folder, sometimes it show the new folder right away and let me rename it, sometimes I have to click refresh to see the new folder. It's not a problem of responsiveness actually - the problem is that FD use a Filesystemwatcher with "watch subdirectories" set, and this doesn't work in Mac/Linux filesystem. So this is still something to fix. I suppose your changes (can you just provide the patched files?) can be gathered into a "compatibility" mode that can be activated when running under Wine (I wonder if we have a way to detect it). The patch source files are included in the download above. Basically, I prevent turning wordwrap of RichTextBox on and avoid switching scrollbars mode so often. These are some issues of a Windows' control that may eventually be fixed from Wine team. This patch may be not needed in the future. I have consulted Wine's FAQ some time ago and unfortunately, it clearly says that there's no way we can detect an application is running under Wine/Linux environment. But your idea about a compatibility mode is great. User will manually turn it on if they are running FD on Wine. Conan, first of all, thanx for your efforts. Any idea, what can be a problem, here? Looks like I ran into the same error when trying to patch FD4. When I tried to check out the exact revision of the FD build (mine is 1751), patched from there and the error was gone. If have time, maybe I can patch and upload the binary for latest build of FD4. Anyhow, nearly got it to look like the screenshot, with the exception that the windows are all unthemed/are out of place, etc. Also my project files center doesn't work when I save more than one file to my home folder. Otherwise, encouraging to see this actually somewhat works. Look forward to seeing better integration in FD4! I wanted to know if the patches were already included in the last version of FD 4? There is something we can do to provide feedback so FD runs better under Wine? The patch is for FD3.3.2 only (may be 3.3.4 will works) but it is absolutely not compatible with FD4. I have a plan to patch FD4 when it is released officially. Currently, I'm testing FD4 R1864 in Ubuntu 11.04 and found that the tooltip is completely unusable. (It seems to appear when context requests but only a 1px height line is visible). I'm investigating the source code in order to have it fixed. Great to know you're working on FD4. Please, if you need any help testing or whatever you may think necessary, don't hesitate to ask. I'll do what I can to help you.